Think: Floyd Experience, Pink Floyd saxophonist and rhythm guitar player Scott Page's new project with Roger Waters' Robbie Wyckoff, Jane's Addiction's Stephen Perkins, Fishbone's Norwood Fisher, Kid Rock's Kenny Olson, Jon Stankorb (of Signs of Life, the American Pink Floyd) and Pink Floyd background vocalist Roberta Freeman has been enjoying a run of successful shows in a unique Los Angeles venue: they play again this evening and tomorrow night. 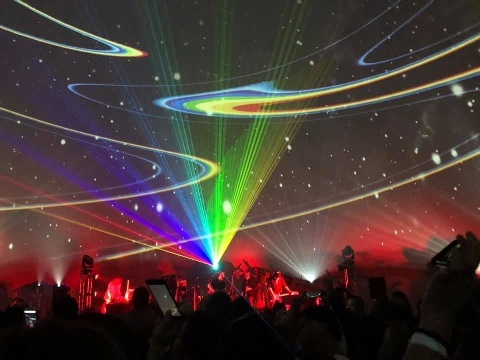 Think: Floyd Experience, which launched a few weeks ago, has performed several sold-out shows at Los Angeles' Wisdome. Wisdome is described as a "fully immersive entertainment art park"; the facility is a "35,000 square foot art and entertainment park located in the heart of the Los Angeles Arts District featuring technologically advanced, fully immersive audio-visual experiences." For anyone paying attention to Los Angeles over the last 20 years, this venue is in the middle of downtown Los Angeles' epic renaissance. In addition to being known for his tenures with Toto, Supertramp, and Pink Floyd, Page is recognized for combining multi-media and technology to create immersive experiences. In 1992 Page organized "The Grand Scientific Musical Theatre," a multimedia concert fundraiser in Las Vegas. It was a fundraiser for the National Center for Missing and Exploited Children. It was done in conjunction with giants such as Microsoft and IBM, and featured Cirque du Soleil, Todd Rundgren, Alan Parsons, The Turtles, Jon Anderson, Graham Nash, John Entwistle, James Burton, Tower of Power, Edgar Winter, Jim Keltner, and guitarist Jeff 'Skunk' Baxter and others. Think: Floyd Experience is Page's latest effort to converge technology and music to create a more visceral live performance experience. The shows are this evening (Friday, December 28th) and tomorrow night (Saturday, December 29th) and run from 7PM through 12AM PST (the concert itself takes place at 10pm PST). Tickets range from $49 - $99 and can be purchased atwisdome.la/think-floyd-exp . You can read more about Wisdome at wisdome.la and about Think: Floyd Experience at facebook.com/thinkEXP/ as well as thinkexp.co.